The ValidationSummary helper method generates an unordered list (ul element) of validation messages that are in the ModelStateDictionary object. The ValidationSummary can be used to display all the error messages for all the fields. It can also be used to display custom error messages. The following figure shows how ValidationSummary displays the error messages. Visit MSDN to know all the overloads of ValidationMessage() method. By default, ValidationSummary filters out field level error messages. If you want to display field level error messages as a summary then specify excludePropertyErrors = false. So now, the following Edit view will display error messages as a summary at the top. 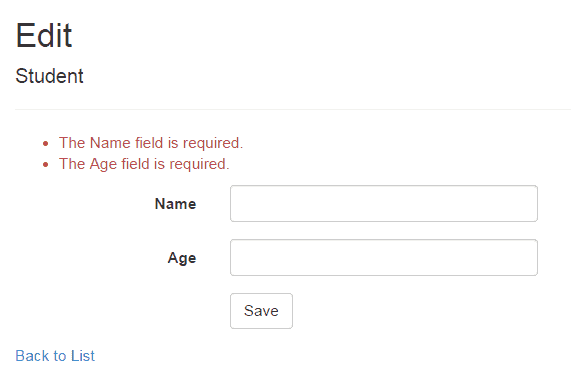 Please make sure that you don't have a ValidationMessageFor method for each of the fields. You can also display a custom error message using ValidationSummary. 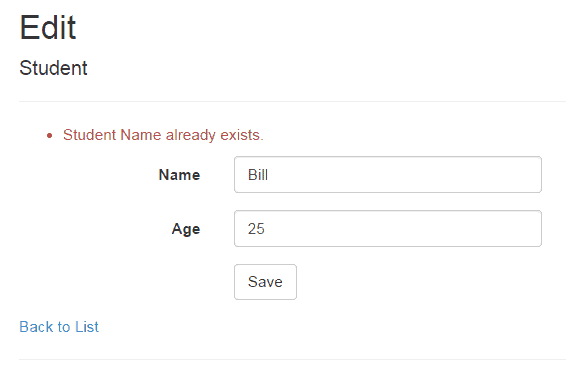 For example, we want to display a message if Student Name already exists in the database. To display a custom error message, first of all, you need to add custom errors into the ModelState in the appropriate action method. As you can see in the above code, we have added custom error messages using the ModelState.AddModelError method. The ValidationSummary method will automatically display all the error messages added into ModelState. Thus, you can use the ValidationSummary helper method to display error messages.